November 30, 2002: The Sufi poets believed in a universe beyond the sensory world, a place they called the mundus imaginalis, which is "a concrete spiritual world of archetype-Figures, apparitional Forms, Angels of species and individuals," and it seems to me that it is there (or some place much like it) that Robert Bly has often gone to create his best work. Bly’s poems keep opening up interior realms, like floors giving way, and have great spiritual access. At times, he is Thoreau in Minnesota, scrupulously observing the natural world, preserving the wilderness that is both within and without, unleashing his wrath against imperial power. "The walls of my poetry house are splashed with blood," he writes in his poem "The Trap-Door," "I don’t want to be inward." At other times, he is like the 14-year-old Jabir the Brilliant, arranging sounds so that they become holy. "Friends," he declares in the same poem, "each day I crawl over and kiss some of the books I love." I’ve always been struck by how political outrage and spiritual reverence sit side by side in Bly’s work. 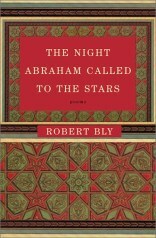 These thoughts are occasioned by Bly’s collection The Night Abraham Called to the Stars (2001), which recently won the Maurice English Poetry Award for a distinguished book of poems published in the preceding calendar year by a poet over 50. Maurice English, who was a poet, a translator and the director of the University of Pennsylvania Press, had a keen intelligence and a lifelong devotion to poetry, and Bly is a worthy recipient of an award in his honor. Bly has often found models for his poems in other cultures, and in this book he displays his reverence for Islamic poetry, especially the work of Rumi and Hafez, by adapting the ghazal form. He ignores some key traditional elements of the ghazal, but he does capture its feeling of boundless surprise. What he especially loves about the form is how each stanza operates as an independent unit. The subject matter changes from stanza to stanza, which gives a sense of leaping around, of rapidly shifting landscapes. Meanings accrue through association, and there is a liberating feeling of freedom within the prescribed form. I find a sacred sense of gratitude animating Bly’s poems, which move fluently between the material and the ethereal. "Some people love only money," he once said at a reading, "and some people love only eternity. I’m half-way in-between." Like Abraham from the Koran, the figure he writes about so well in the title poem of his new collection, he is "a man in love with the setting stars." We are faithful companions to the unfaithful stars. The dirt flying out from behind our hind claws. Beautiful. It is our badger soul that thinks so. Walking with muddy shoes in the wet fields. We resemble exiles in the kingdom of the serpent. We stand in the onion fields looking up at the night.